Rumors have been rampant that Apple is planning to drop the headphone jack from its next iPhone, so it’s perhaps no coincidence audio companies have been announcing devices that can play audio directly out of a Lightning port. One of these was Audeze with its high-end EL-8, released in December. But its cumbersome size means that it’s hard to engage anyone beyond Audeze’s traditional audiophile audience. Almost every headphone on the market uses dynamic drivers, which are basically the same as the large cones that pump out sound from your speakers. These use magnets to move a thin film and create sound. That’s why the Sine are particularly notable: they’re planar magnetic, but not huge. In fact, they are worn on-ear instead of the typical over-the-ear style necessitated by the large hardware. Although I only tried them for a few minutes, the headphones are so comfortable I can’t imagine having trouble listening to them for periods of time, and flexible enough to be folded flat. So how do they actually sound? No surprise; pretty great. It’s hard to do serious critical listening in the crowded event space of CES (I’ll try to find a quieter spot to give them a listen later this week), but at the risk of sounding cliche, I was noticing details from recording I never did before even with the crowd around us (and mind you, I’ve been listening to the soundtrack to ‘Star Wars: The Force Awakens’ on repeat all week.). Treble in particular was wonderfully detailed, adding texture to John Williams’ brass runs, while bass was controlled but powerful enough for my tastes – don’t expect Beats-level boominess (ugh). Meanwhile the soft leather enclosures did a solid job of blocking outside noise without any active noise-cancellation circuitry. The Audeze Sine are understated and come in at a manageable size. They presented a relatively large soundstage (how ‘out-of-your-head’ the music sounds) for small, closed-back headphones. Normally you wan’t something with an open back to get a more speaker-like sense of space from your headphones, but those come at the expense of letting everyone around you know you’re listening to Justin Bieber. The advantages of the Lightning connector were a bit less clear, but here are some theoretical advantages to the technology. You can bypass the iPhone’s internal DAC (digital-to-analog converter) and amplifier to let the headphones process a pure digital signal themselves, or you can simply have the headphones draw more power than the headphone jack is capable of providing. It was too crowded for a fair comparison, but I did think I could eke out some more detail (and extra volume) from the lightning port than the headphone jack – they sounded great. 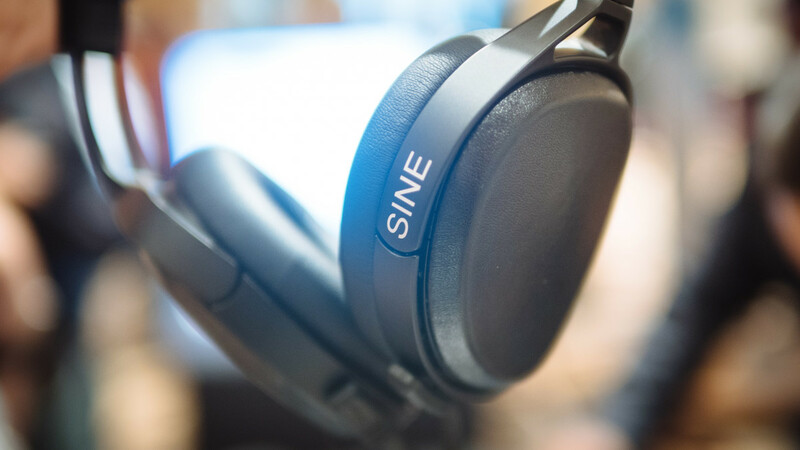 But then again, they better: the Sine will sell for $499 when pre-orders begin in late January for a February ship date.